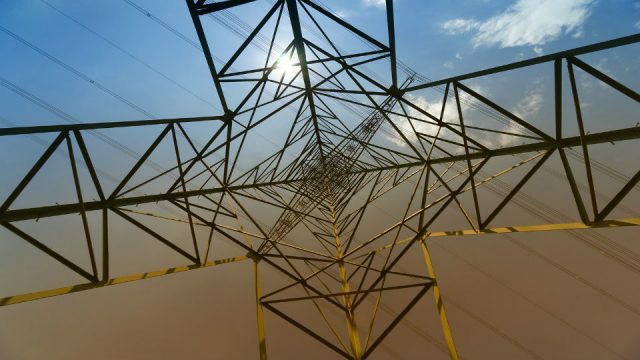 Gas industry advocates argue that expansion of gas infrastructure is justified because it will be possible to switch to low-carbon gases such as hydrogen and biomethane in future. But research by the International Council on Clean Transportation (ICCT) predicts that biomethane production will remain modest, even with massive subsidies. The idea that Europe’s gas sector could go carbon-free by 2050 is nothing more than a pipe dream, according to new research. 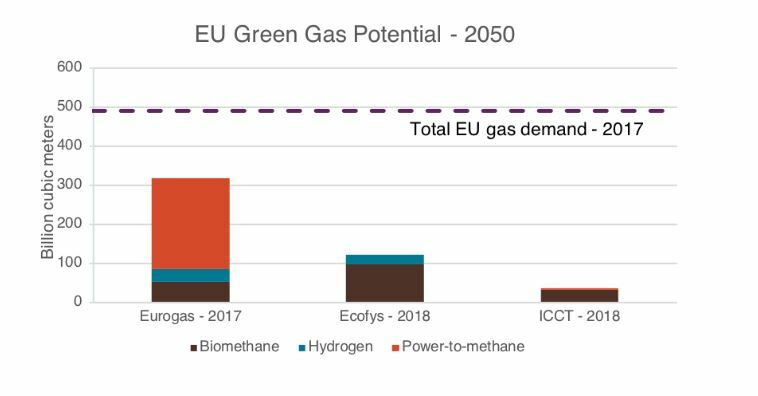 A study by environmental policy analysis group the International Council on Clean Transportation (ICCT) shows renewable methane, the most promising low-carbon natural gas substitute today, could offset at most 12% of total projected European gas demand in 2050. The gas industry has put forward various estimates for the amount of renewable gas that could go into Europe’s energy system by 2050. Last year, Beate Raabe, the secretary general of Eurogas, the trade association representing the interests of the gas industry in Europe, gave a figure of 76%. Gas Wind and Sun, a Eurogas website, says the level could be 70%, amounting to around 322 billion cubic metres (bcm). 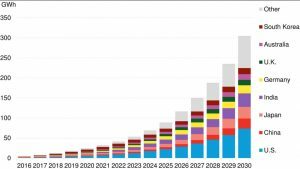 A study in February by the Navigant consultancy Ecofys, funded by a gas industry consortium called Gas for Climate, came out with a more modest estimate of 122 bcm by 2050. More than 80% of this gas would be in the form of renewable methane, said the study, which the remainder being renewably-produced hydrogen. Biomethane is produced through anaerobic digestion, a mature technology, which is why it is seen as a frontrunner in the race to decarbonise gas. Partly this is because the ICCT researchers take a dim view of some of the more optimistic assumptions of previous work. For example, the ICCT team dismissed the potential of using renewable energy to create methane synthetically, or so-called power-to-methane, because in the short term it would involve high production costs and limited greenhouse gas reductions in Europe between now and 2030. 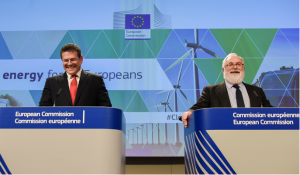 The ICCT also disagrees with Gas for Climate over the potential to use ‘cover crops’, or vegetation grown in alternate seasons to major crops, as a source of biomass for renewable methane. Some other sources, such as wastewater sludge, are relatively easy to turn into biomethane and are already being used on a small scale, for instance for district heating. But perhaps the biggest challenge in growing biomethane production across Europe is its cost. The high cost of biomethane production in Europe is a result of the continent’s agricultural economy. The greatest source of biomethane feedstock is from farms, but in Europe these tend to be much smaller than in America, for example. A farm with, say, 50 cows does not offer great economies of scale for manure production, which makes it hard to build a biomethane business case. And even if a group of farms could deliver enough manure to make it worthwhile to invest in an anaerobic digester, the cost of transporting the resulting biomethane to an injection point, or building out a gas pipeline, would be “prohibitive,” Searle says. A more efficient option might be to burn the biomethane on site, to create electricity, the ICCT estimates. “It’s doable with policy incentives,” Searle says. Whether policymakers would be keen to introduce expensive subsidies for biomethane, at a time when other renewable energy sources are moving away from subsidy schemes and towards auctions, is a debatable point. There is no one technology to decarbonise heat…..heat pumps, electricity storage heaters, biomethane are all necessary. As is H2 into the grid, making CH4 from wind and Bio-SNG. Completely agree John. We’ll need local solutions fit for the local situation. There’s no point converting a village to hydrogen if there’s no gas network in the village. Likewise, there’s no point electrifying heat in a a city that has an extensive biomass fired district heating system. The cost of power-to-gas has reduced dramatically in the last few years, with new ‘zero-gap’ alkaline electrolysers now at 80% efficiency with the same low cost as conventional alkaline, while PEM is predicted to drop a further 50% before 2025. 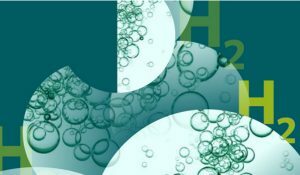 Combined with low-cost renewable electricity, this makes domestic gas production competitive – Siemens have just stated that renewably produced hydrogen will be competitive with SMR hydrogen ‘within 5 years’. 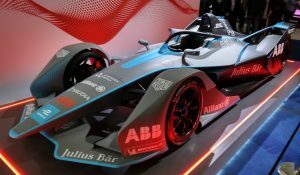 So whether this hydrogen is methanated at scale before 2030, or soon after this point – the point is that it will be competing with natural gas. And the economic advantage of domestic production over imports does not need to be underlined; there are various synergies with renewables and other industry that make the process & value of domestic fuel production guaranteed. The only way to decarbonise is via hydrogen and power-to-gas, although many oil & gas companies are very reluctant to admit this. Cost is one thing (and not yet proven). The other is quantity. My simple estimate is that replacing the current natural gas consumption in Germany with synthetic methane would by itself require 2 1/2 times Germany’s current electricity production. This could be achieved only via massive imports (and corresponding renewable electricity and electrolyser installations in other countries. So reducing gas consumption is crucial. I presume that the situation in England is not a lot different (except for better offshore wind). This is very true. Simon Verleger, who is a research co-ordinator at the Store & Go project (affiliating 27 European research groups), puts the figure at 1400TWh which equates to about 300 GW of installed capacity, or about 35% of current annual EU electricity production (qualenergia .it/articoli/power-to-gas-limiti-e-opportunita-del-metano-prodotto-da-rinnovabili/). There are a number of 100MW power-to-gas plants in planning throughout Europe now, and more will be announced in coming months and years. 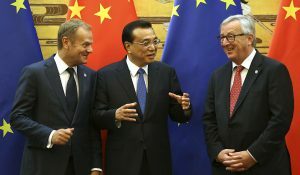 Both the European TSO operators and Eurelectric have placed considerable emphasis on the importance of power-to-gas in order to achieve any realistic decarbonisation; and this is with an association that represents 3,500 electric utilities (with 30 working groups and 5 supervisory committees) and therefore would be inclined to avoid gas from their decarbonisation projections. This is not the case; they put power-to-gas/power-to-x (“indirect electrification”) at about 15-20% of Europe’s total energy demand in 2050. Dena have outlined between 1-4GW of electrolysis by 2030, and France have already signed up for 700MW, now with a new supplier. Just today, Engie have offered €800 million to biomethane projects in France, accepting that greater integration of existing smaller farms’ waste streams will be important to boost biomethane feedstocks. However the real news is as you say that lower electricity costs can be found outside of northern Europe. WEC Germany recently commissioned a report by Frontier Economics (who have authored a previous report on power-to-gas) outlining just how Germany (and by extension, other European nations) may source hydrogen and renewably produced fuels (ammonia, synthetic methane or methanol) from areas across the world with significant solar and wind resources (weltenergierat .de/ptxstudie/). They will benefit from exporting equipment & technologies. *Note: the 1400TWh figure is for all of Europe, not just Germany. We have about 1000GW of capacity today. Actually when asked by the press Engle denies they will be investing 800 millions as they used the term “mobilized”. They expect most of the burden to be carried by public money and farmers. If the gas companies were truly believing their claims about greening the gas grid, why do all their investments and long term contracts in natural gas takes the hypothesis that there won’t be a greening of the gas grid ? Because that’s nothing more than “CCS ready coal power plants” that were never equipped with CCS : a communication tools to delay any actions like Denmark who made it illegal to install a gas boiler in a building. All the scientific studies that invented the concept of power to gas don’t see any applications of it in the heating sector. If you have renewable electricity it’s easier to turn it into not water rather than methane, if you have biogas it’s easier to convert it to electricity and heat rather than biomethane (BTW Eurelectric is a CCGT lobby so it makes sense for them to avoid a future dominated by CHPs and energy services companies). Power to Gas makes sense in the transportation sector but power to liquid could just kill the whole idea. Denmark have a mature district heating system which even reaches to some suburban areas, and covers two-thirds of the population (using CHP plants). For countries without an extensive district heating system, gas provides up to 5 times more energy in winter than electricity, meaning that a shift to electricity for heat would require large amounts of new capacity and transmission infrastructure independent of the way in which electricity was used for heating within the home. Interestingly, both Russia and China both have extensive district heat networks. “All the scientific studies that invented the concept of power to gas don’t see any applications of it in the heating sector.” – Wrong. You obviously haven’t read any studies. I would note also that a) it is accepted that any decarbonised heating strategy adopted by policy is going to be more expensive than the current system, but b) because GDP is likely to increase (across the board) between now and 2050, this won’t actually affect many people’s income to any extent. The benefits will significantly outweigh the costs. Also; I do agree that in countries that do not experience very cold weather, ASHPs for space heating (rather than water heating, which doesn’t change much seasonally) is probably a good idea if they also offer cooling as this is likely to be a very important factor as temperatures/heat waves are going to increase as the century progresses. Fuel cells (co-gen) will also improve both heat and electric efficiencies, and can be powered by hydrogen. This is a good reason to upgrade gas networks to polyethylene. Michael Sterner is one of the inventor of Power2Gas and his work is backing my claim. Before Denmark developed district heating, there was no district heating in Denmark you know… Most of the countries who choose district heating during the oil crisis were able to equip their country in a decade or two, and we did not have the technology we have today. District heating are just hot water pipes, it’s quicker to build district heating nets than it is to build an electrolyzer fleet (granted you already have electrolyzer factories). The same goes for electric heating, taking into account that we won’t need to upgrade any lines because the load will be served with renewables and renewables are low density energy sources that need to be spreaded out in the territory. So the production will be close to the demand and it will actually decrease the cost of transmission since you won’t need to pay to export renewable electricity that have been used for heat needs locally. Thing is : fossil gas is no longer competitive in Europe for a lot of applications how do you expect a much more expensive gas to be able to compete ? The market won’t stop expanding district heating and power2heat because you are developing power to gas. Also access to the gas grid is not universal in Europe, far from it… So if you want to decarbonize heat with you will need to expand the gas grid in place where it has never been competitive to do with cheap natural gas so it won’t be competitive at all with Power2Gas. [Electricity] “production will be close to the demand and it will actually decrease the cost of transmission” …How? The majority of the electricity transmission costs are fixed because they relate to the transmission networks that already exist. They are not going to be significantly diminished. Also, how do you conclude that fossil gas is no longer competitive in Europe for “a lot of applications”? You’re right, it can’t compete in the electricity merit order against renewable generation, as it has zero (or even negative) marginal costs. But the renewable generators only exist because of the subsidy/support mechanisms, which is what is needed to get biogas/biomethane brought to market. There’s a natural limit for the volume of biogas/biomethane which is dictated by available waste streams. But if we do not use AD to process those wastes, then we will emit methane to atmosphere… which somehow doesn’t seem very sensible… probably better to pay a little bit to capture the energy and convert it to CO2.